Every Tuesday morning our residents at Generations at Columbus Park look forward to the activity: Baking with Shaquira and Ms. Cookie’s card games. As they gather in the dining hall, the residents are excited for their weekly dose of coloring, reading, cookies and card games. 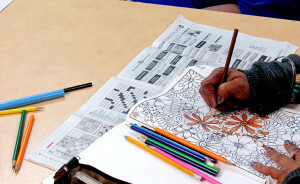 These are a few ways that the residents enjoy their leisure time and keep their minds engaged. Also these activities have therapeutic purposes for our residents. While they are socializing and anticipating the delicious flavors of their treats they are learning vital nutritional information and enjoying camaraderie by playing cards together. Previous research has proved anxiety levels dropped when subjects colored mandalas, which are round frames with geometric patterns inside. Read more about adults and coloring book therapy and schedule a tour to stop by on Tuesday and join us for cookies and cards! Learn more about Columbus Park and their services here.